This delightful retreat is located on the main floor of a turn-of-the-last-century house in historic old Ballard. It is a complete, fully functional home with a fully equipped kitchen. Nothing is shared with the upper unit except laundry facilities in the shared entry. Acoustic insulation insures that you will hear little if anything from your upstairs neighbor. Ballard has everything you could want. Living in this home, it's all at your doorstep! Within 1 block you can enjoy espresso and some of the best bread and French pastries in Seattle. Within a 6 block radius you can enjoy an upscale movie house, a diverse array of restaurants, large QFC grocery store, shops and the fabulous year-round Sunday Farmer’s Market offering fresh locally grown produce and products. If your visit is job-related, you will also have access to a post office, FedEx, and built-green public library. A detailed renovation was completed in 2008, in keeping with the home's original character. Wide plank oak floors extend throughout, including the new kitchen. The kitchen is cook-friendly and there is an herb garden for your enjoyment. Guests can chat with the chef while sitting at the breakfast table. The main dining room can seat six and there is still room for a sofa. Barn doors separate the dining room from the very spacious living room. It can be closed off for privacy and has two queen sized high end, no-bar hide-a-beds and a 26 inch flat screen TV. There is another queen sized sleigh bed in the private bedroom with lots of drawer space and ample storage. The acoustic insulation is amazing! This home is very peaceful and quiet. shared landline phone in the entry for emergencies and local calls only. New front-loader shared with one other unit. There is one off- street parking space on the property. It is located to the west of the one car garage. Garage is not available for this apt. TV in living room gets local channels and Netflix. There are some novels in the apt. and the public library is 2 blocks away. There is a small back yard that can be used to sit in the sun and do some grilling on the charcoal grill. Small yard, herb garden, One block away from French pastries, bakery and espresso. Less than six blocks to restaurants, shops, library, movie theater, and Sunday farmer's market, and glass-blowing hot-shop where you can watch artists create their work. Comfortable apartment with well stocked kitchen. Great location in Ballard with nearby amenities. Location was great and the apartment very comfortable. The kitchen was well stocked...allowing serious cooking. We cooked a full Thanksgiving dinner for eight people. We spent two and a half weeks at Mary and Bob's house in Ballard and had an excellent experience. 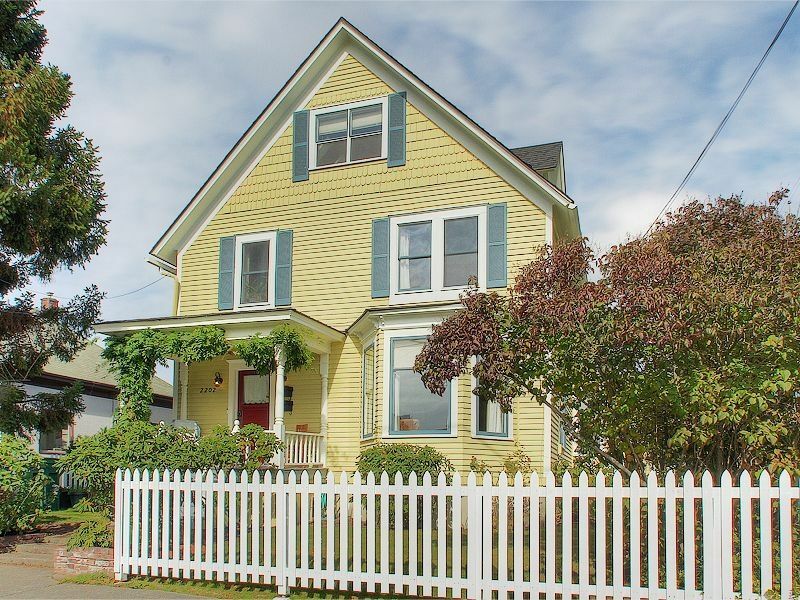 The house is perfectly situated - close to transit options, the Market Street and Ballard Ave commercial corridors, etc. It's in a quiet neighborhood but close to the hubbub. (We were there with our toddler, who loved walking down the street to the Ballard Branch Library.) The space worked really well for our family of three. It's nicely updated, exceptionally clean and has everything you need for either a short or long stay. Mary was fantastic to coordinate with and clearly puts a lot into ensuring that her guests have a great stay. The house was very pleasing and perfect for my needs. The location was perfect, just a block away from my daughter’s family. The accommodations were comfortable and the house was very clean. cozy victorian, off street parking spot in a pedestrian friendly neighborhood. walk to everything. Remodeled to original detail - victorian apt on the 1st floor - the hardwood floors don't even squeak. Large kitchen with a gas cooktop. Walk to restaurants, shops, farmers market, grocery store bakeries. Explore the area on foot - the busy Ballard Locks, watch the salmon in the fish later. Walk along the Shilshole Marina. Easy public transportation options to downtown. We had another wonderful stay at the Victorian Retreat this past week. The house is in a great location for walking to the library, farmer’s market, and all the shops and restaurants in Ballard. You have easy access to Seattle Center and downtown via the Rapid Ride and it’s a quick drive to the zoo, or to play at Greenlake or Golden Gardens. The apartment is super clean and well maintained and has been in all the years we’ve stayed here. We love this place! Five minute drive to indoor rock climbing gym, boat locks with salmon ladder, waterfront seafood restaurants with stunning views, and saltwater beach with bonfires at night. Stays of 30+ days do not require sales tax. This site will automatically include it but if you contact us we can remove it.